Not every car we feature is obvious at first. Some make you work to find them, some come via a secondhand story, and some are simply tip-offs from trusted sources. But others – as was the case with Morten Ruud’s 1986 Alfa Romeo GTV – just creep up on you. It all came about after a conversation I had with Rod in the Speedhunters pits at Gatebil Rudskogen after a session shooting trackside. We were discussing what we had just witnessed and Rod asked if I had seen the “red Alfa Romeo”. 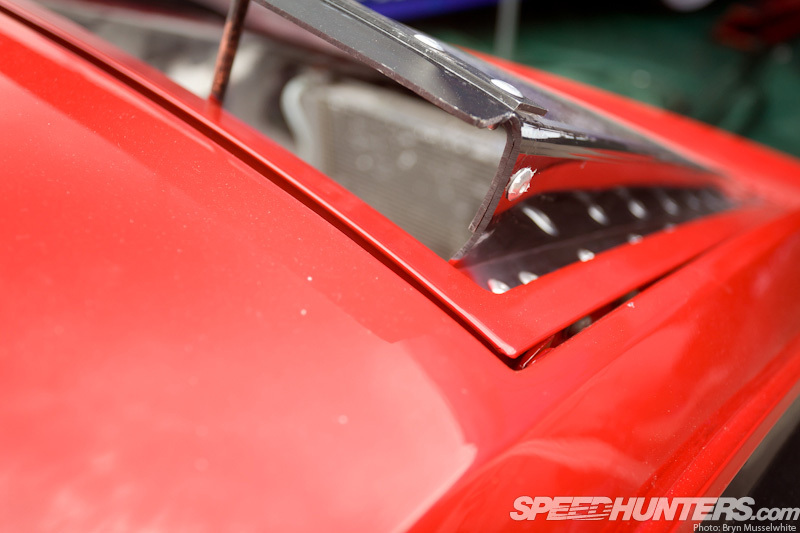 Being the only Alfa out on the track there was no need for further description, but given that it appeared to be running front-mounted intercooler and rear-mounted radiator, we both knew we had to take a closer look. After a long walk we found the GTV pitted alongside all the other serious time attack machines, and quite rightfully so. Whoever had been driving the car was having a very good time and it appeared to be deceptively quick too. 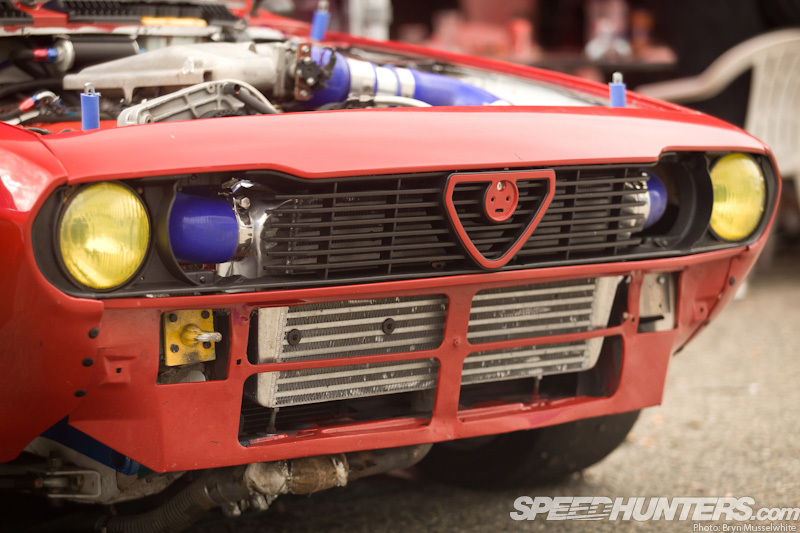 I say that because compared to a lot of the Gatebil machinery there was very little drama with the Alfa – just rapid progress and the ability to reappear at the same corner seemingly quicker than a lot of other cars in the group. Remember what I said about feature cars creeping up on you? Now that I sit back and take the time to reflect on Gatebil 2013, I realise we’ve seen this car before, both here on our #featurethis Instagram feed, and amongst last year’s Rudskogen coverage, albeit in a slightly different visual guise. 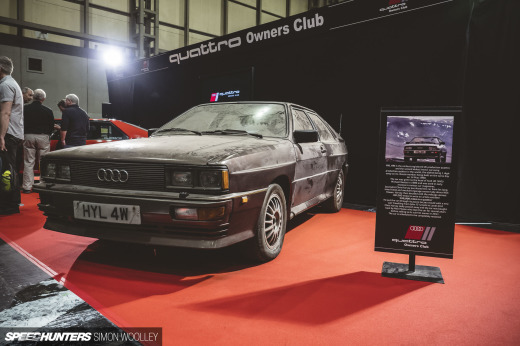 Like fellow my Speedhunter Jonathan Moore, I own an Alfa Romeo – not because I’m overly dedicated to the marque, or reverend Alfisti – but more so that I just like the Italian manufacturer’s cars. That said, the mere mention of ownership often leads to my sanity being questioned – after all, older Alfas aren’t exactly well known for their reliability or their repellence to rust. 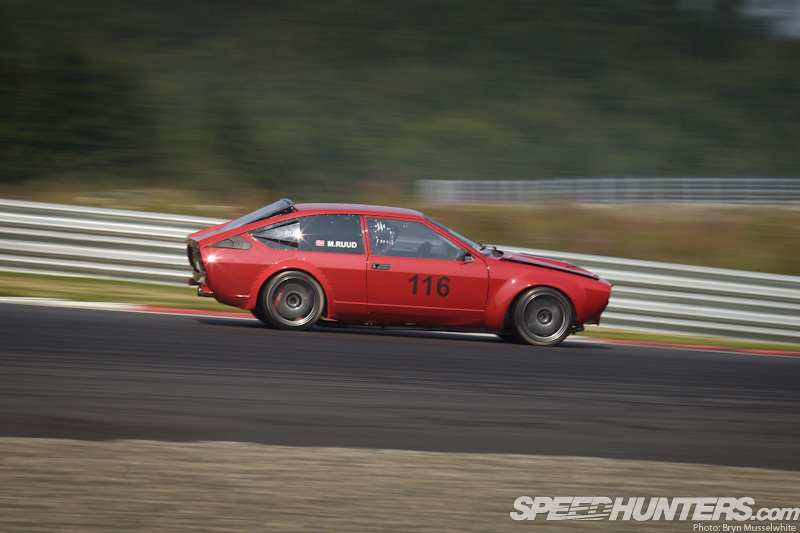 But what happens when you’ve modified virtually every component like RR Motor have on Morten’s GTV? Good things, that’s what. 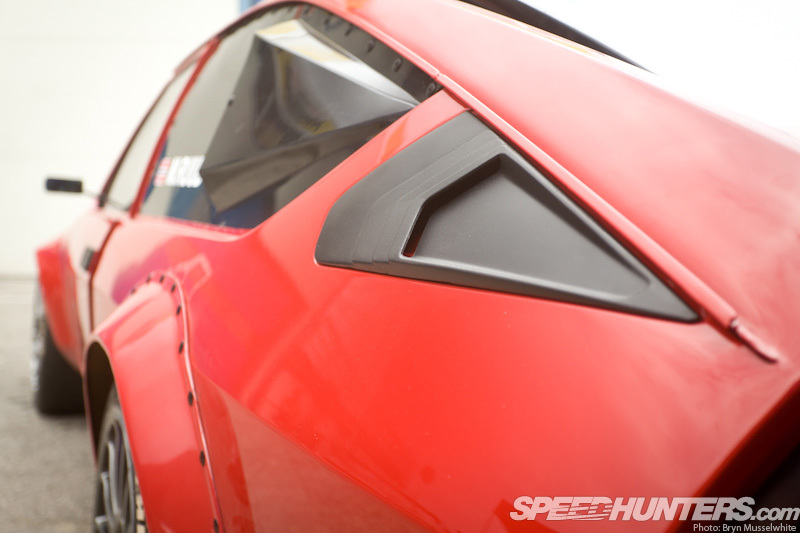 The gorgeous, angular coupe body style remains virtually untouched. Along with the change from white to red, the front end aero has been removed this year and without the large bumpers this model would have worn from the factory it reveals the purity of its original ’70s lines. 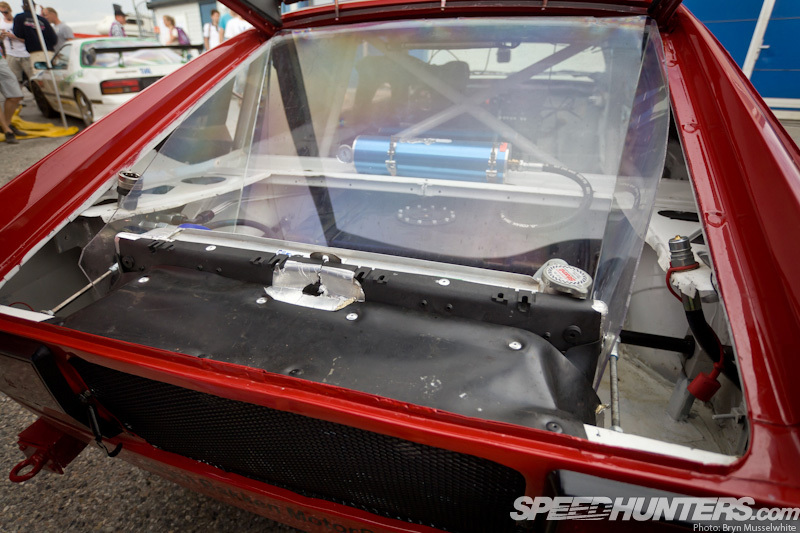 The rear window air intakes are definite giveaway to where the radiator is mounted. Here you can see the pressurised fuel intake on the left, with the air extract point on the right. So if that’s going on at the back, what’s justifying it at the front? A longitudinally-mounted V6 as the car had fitted from the factory – but unlike the original 2.5-litre engine, this is a 3.2-litre V6 24V variant from an Alfa 147 GTA. 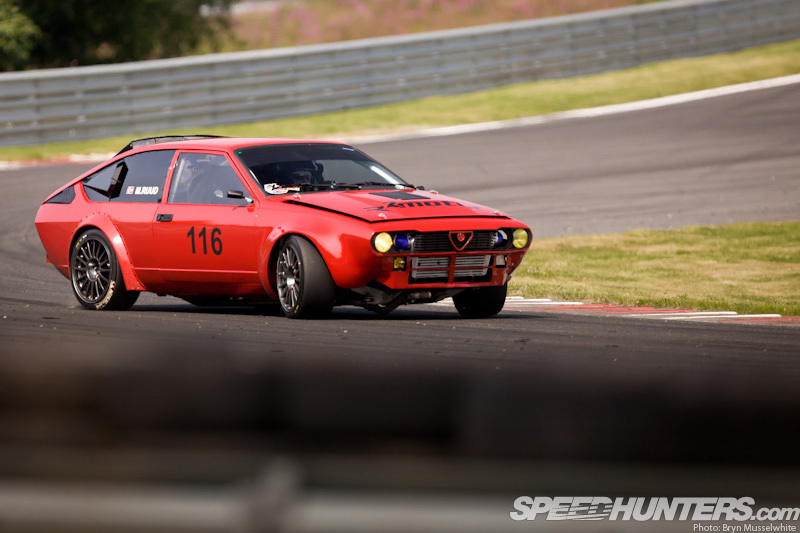 Wearing standard heads, it would have been mounted transversely in the front-wheel drive 147, but RR Motor – which built and maintain the Alfa for Morten – has used a modified version of the GTV’s original sump to aid its switch to rear-wheel drive configuration. 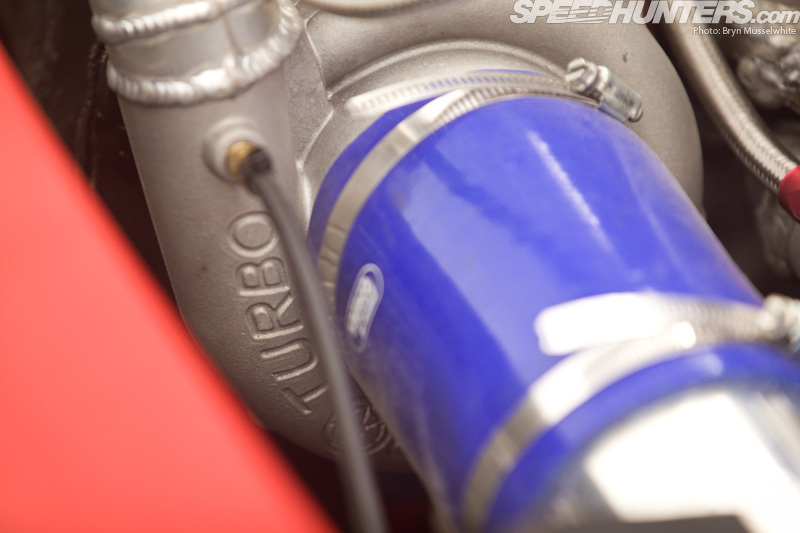 And then there the turbo – a rather large Comp Turbo CT3B 62-67 perched on a pair of custom exhaust manifolds that extend to the front of the engine bay. 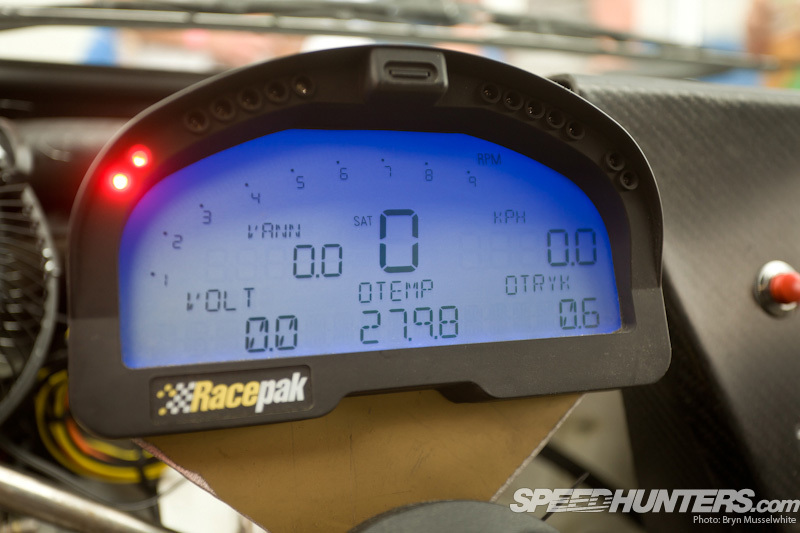 An Autronic SM4 engine management system makes sure everything works together as the guys have used a mix of parts ranging from VW coil packs to a strengthened bottom end to deal with the boost. The result is a genuine 617hp at the wheels and well over 700lbs/ft of torque to boot. If there’s a more powerful Alfa Romeo V6 engine derivative out there, we certainly haven’t heard of it! 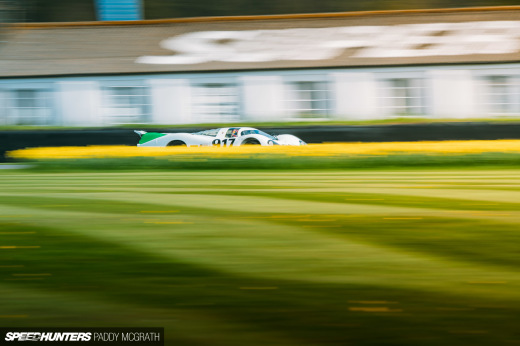 That sort of output goes some way in explaining why it’s so quick on the track, and why, on very rare occasions, it breaks traction too when provoked too much. 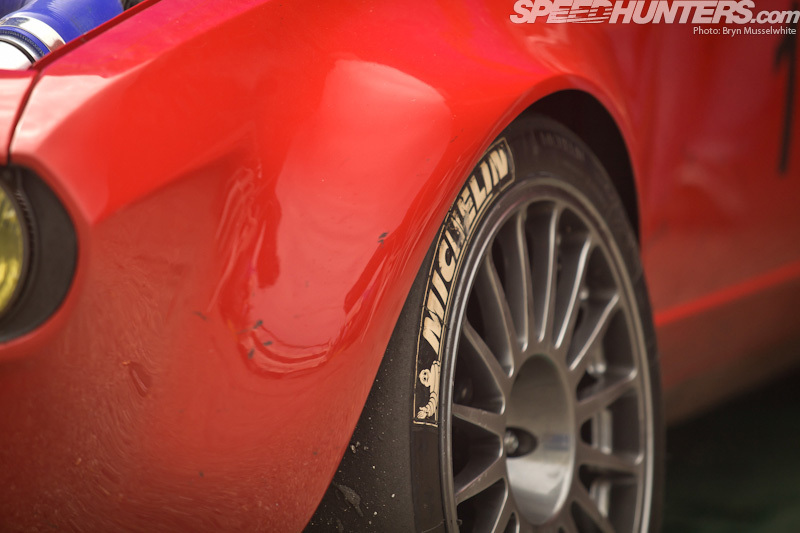 I say very rarely because unlike most of the high horsepower, rear-wheel drive cars you encounter at Gatebil, the Alfa was built for grip. Morten had the coupe built up four years ago for Corsa Italiana – a Norwegian national racing series for all Italian cars over 15 years old, which he still competes in now. During its racing life there has been constant development of the chassis and today the running gear features an incredible hybrid of parts. 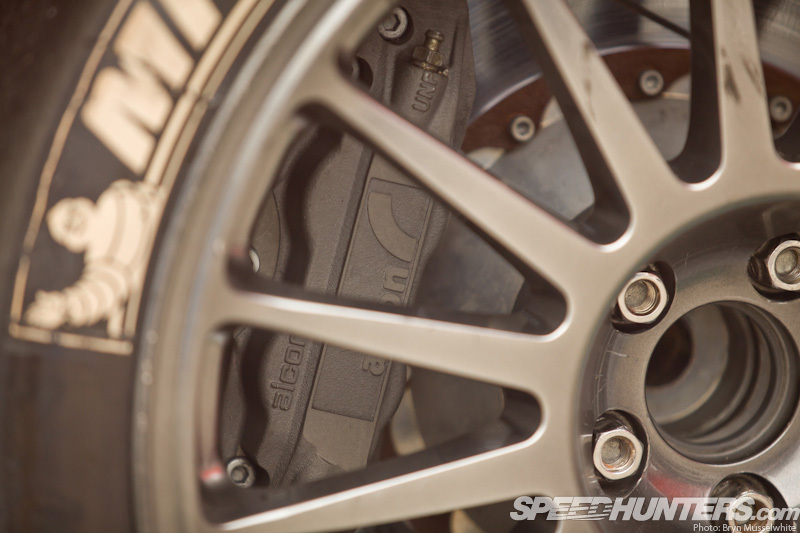 Big brakes are a given, although the Alcon upgrade is all about quality not quantity. That said, the four-piston callipers fitted with Ferodo competition-spec pads do a more than adequate job given the size and weight of car. 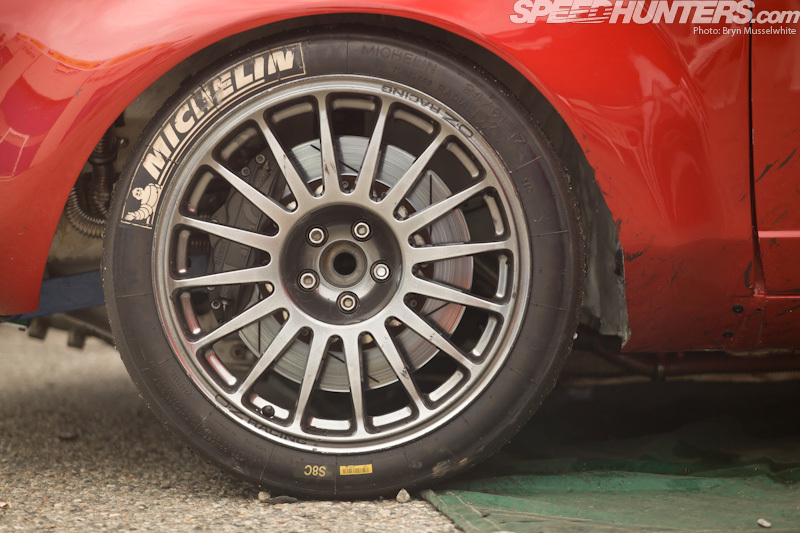 If you’ve driven a car on slicks, you’ll know firsthand just how much difference this one modification can make. It doesn’t take a genius to realise the monumental increase in contact patch and what that means, so when you see a set fitted to an otherwise moderately understated project, a statement of intent is made. Big changes have been made in the suspension too – something evident when the GTV is at speed. This, for example, is a 180-degree left hander taken at around 80mph. Intrax adjustable coilovers are used each corner with the standard rear De Dion set-up retained, but modified for increased camber. 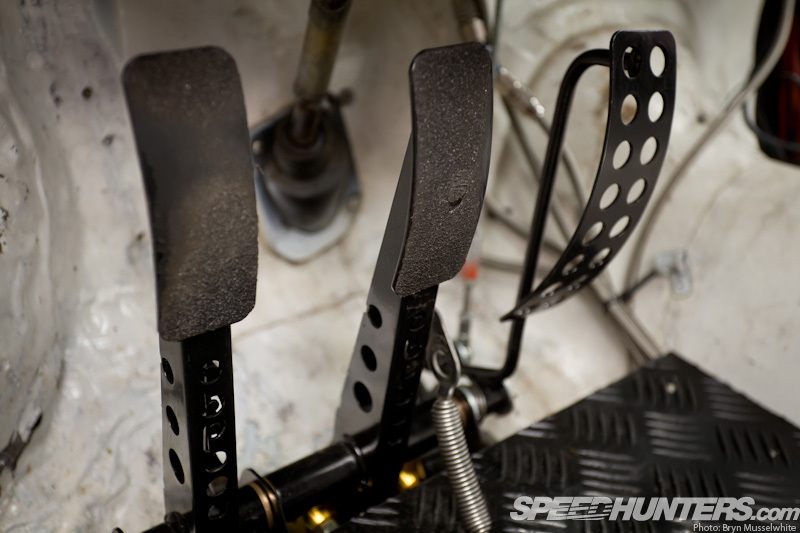 The front strut set up is Volvo v70/S80 design with custom made upper and lower A arms. I guess something had to be Volvo on this build given it’s Norwegian origins. When people are wary of a manufacturer it’s generally because of something in there they don’t really understand. Take Mazda’s rotary engine for example, or in this case Alfa Romeo’s choice to mount the gearbox in the rear with the differential. This makes total sense to me though – there’s the weight distribution aspect for starters, and the ability to have the engine mounted further back in the chassis without having to worry about the impact a conventional rear-wheel drive might have on cabin space. Here you can see the simple shifter that allows you to bang through the straight cut Drenth sequential gears in the Sellholm-sourced gearbox. The rest of the interior is business-like. Protection is paramount and the cage adds some much needed rigidity to the aging shell. 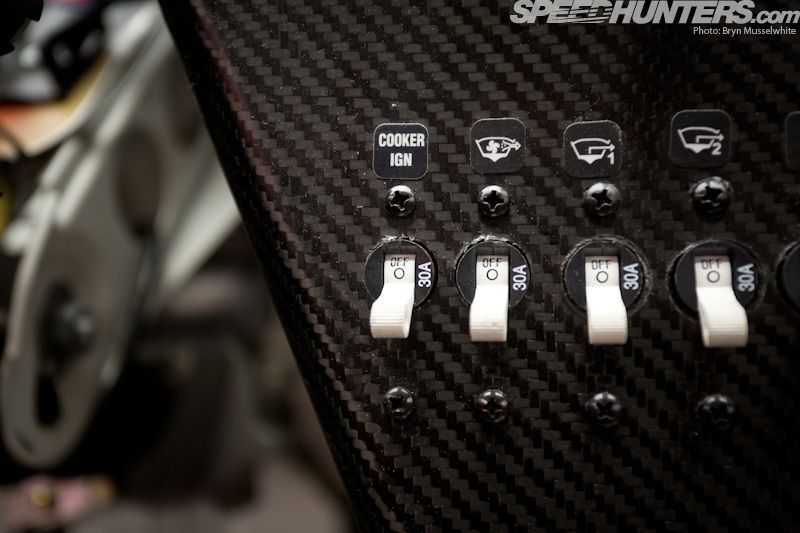 But the interior features some serious hardware too – like the extended, quick-release steering wheel boss. 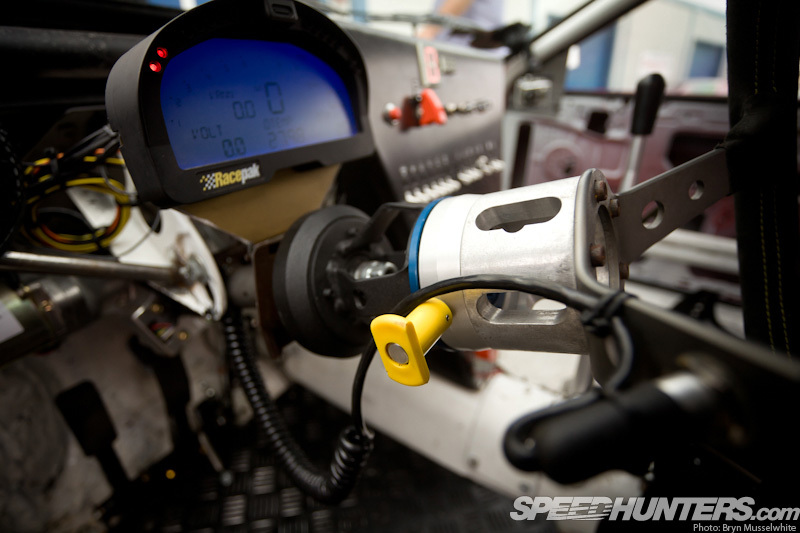 Look at most race cars and you’ll see the distance between the driver and the wheel is often closer than you’d expect if you’ve not driven something similar. This is to give you increased leverage with bent arms and the ability to pour lock on without shifting position. The driver is aided here by the a compact electric power steering unit sourced from an Opel Corsa. 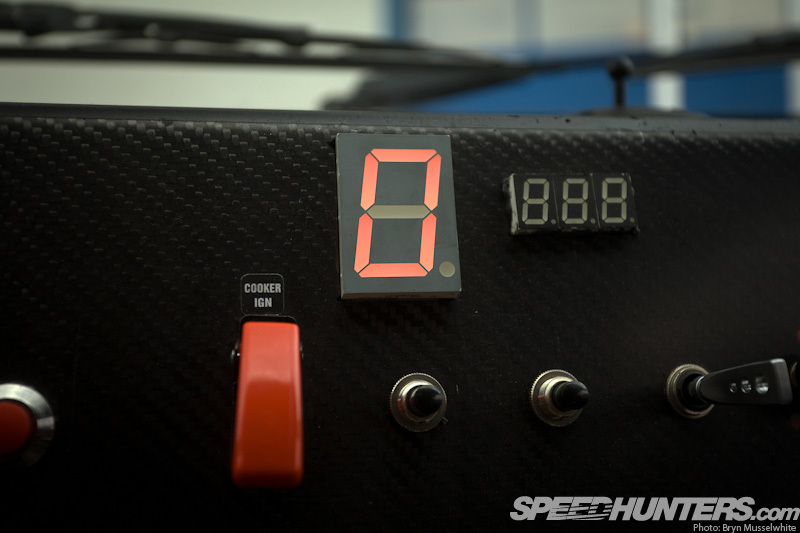 Also in clear reach is the ignition switch and the simple LCD gear indicator – somewhat of a necessity with sequential gearbox and especially so when things get busy in the cabin. I still can’t decide whether the Alfa is understated or not. It’s hard to tell given when you’re wrapped up in the Gatebil experience, but what about out in the big, bad world? 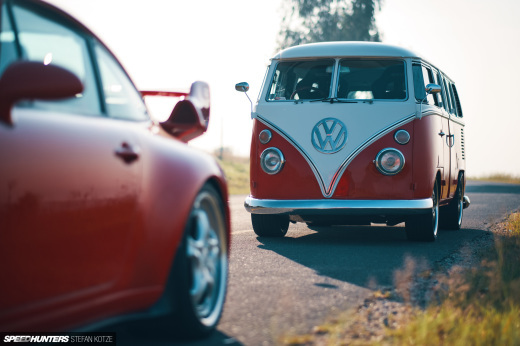 The simple monotone paint scheme and subtle body modifications such as the raised rear window are just that, subtle. 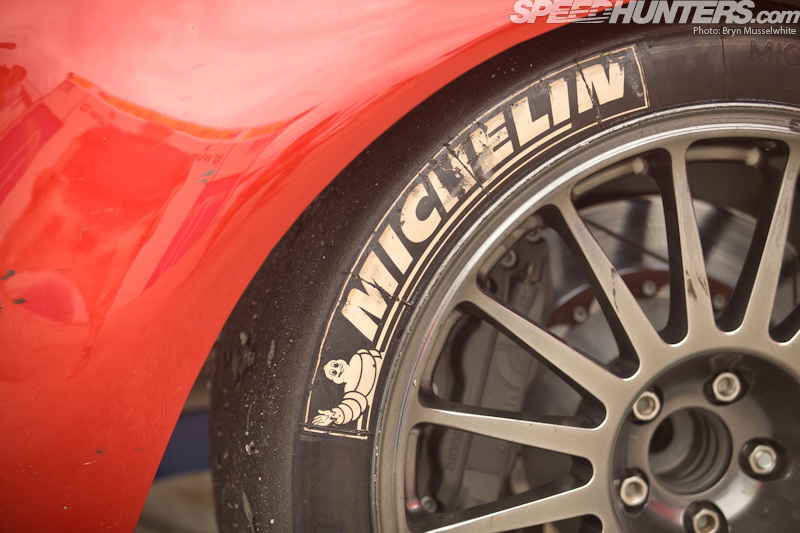 But flared front fenders from Alfapanels in the UK and slicks aren’t exactly common though. This is a car where you have to look deeper to really get a handle on the details. The simple floor-mounted Tilton pedal box is actually quite delicate looking, but well balanced – just like the rest of the Alfa. With the bonnet off it’s quite obviously something special. The engine choice is clever and to me it almost feels like a natural progression from the original rather than a complete departure in the wanton pursuit of power. That’s something we’ve seen a lot of in our Scandinavian theme this month. Like many of builds we’ve covered this month, everything serves a purpose. 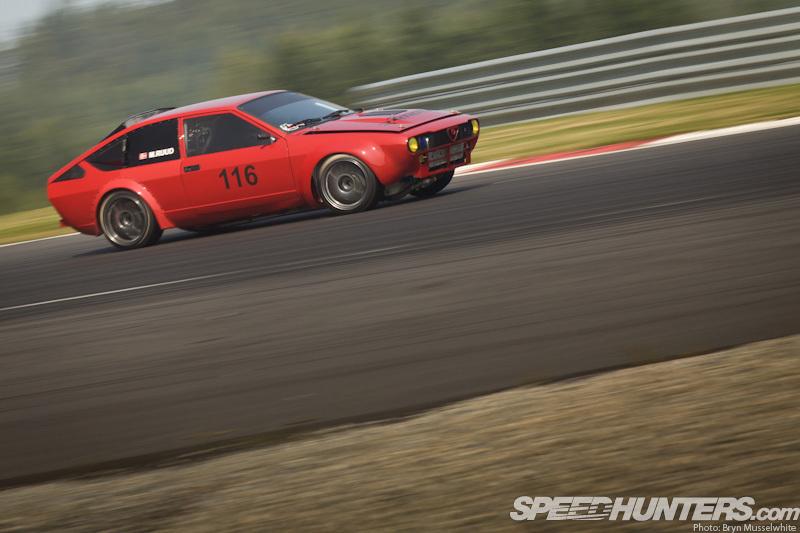 So it would seem that’s how this project fits in to our theme, serving to show us whether it’s an LS-engined Volvo estate , a Toyota-engined BMW or a discreet mid-’80s Alfa Romeo GTV, the Scandinavians have a way of extracting fun and performance like you’ll rarely see elsewhere. Their builds are often outrageous sounding, but in the metal actually quite inoffensive and humble. But always effective. GREAT GREAT GREAT!! Absolute genius! I've been racking my brain to hatch a plan if I should/can convert my 156 3.2 to RWD, (fitting a Rotrex soon, FWD is useless after 300 - 320 hp) just doesn't add up, the old GTV ofcourse is all ready to go! You mentioned strengthening of the bottom part of the engine, that's more than the 2.5V612v sump I assume? And why that sump? Does it have compartments or something to avoid dry running in the corners? Man, this is one great machine. Love it! 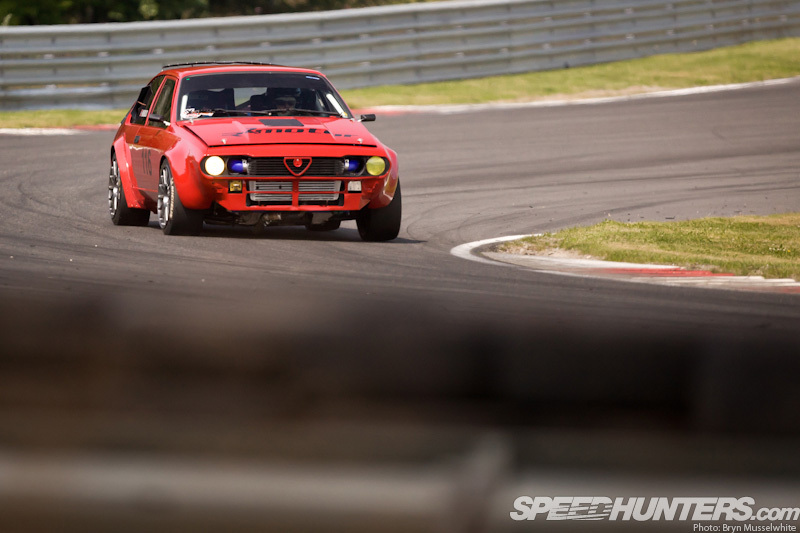 Would love to see a video of this alfa around the track!! Very nice. Dream car.